Rachel Klein Productions’ morbid dance drama, The Tragedy of Maria Macabre, will perform its first full-length production on Wednesday, March 2nd at 7:30 PM at Dixon Place (161A Chrystie Street). 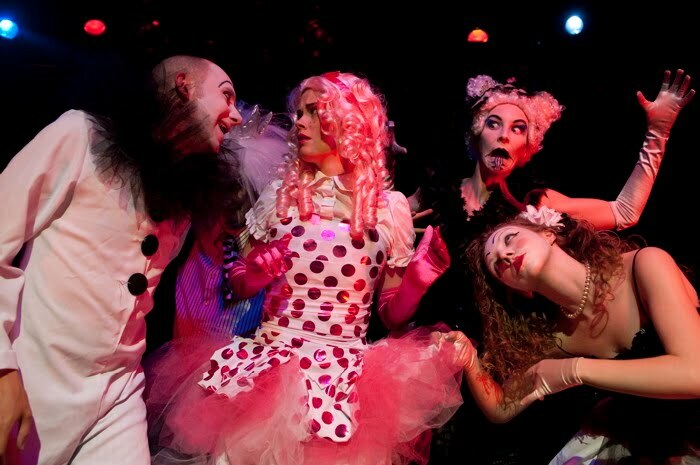 Upon dying, Maria Macabre is not granted eternal slumber, but instead a whirling, kaleidoscopic carnival of horrors: a morbid funhouse where humanity is stripped away and a permanent place in the gruesome chorus line is all but assured. 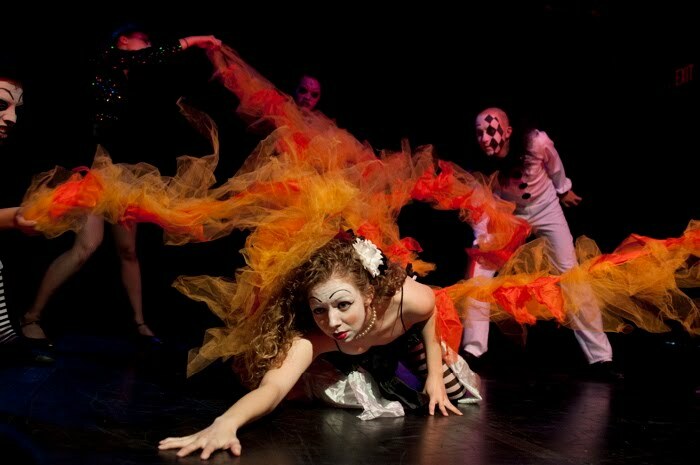 The Tragedy of Maria Macabre is a ghoulish movement and visual based theater piece that uses dancers and physical actors to create a world of fantasy and spectacle. It is a work of theater, dance, and performance art. The Tragedy of Maria Macabre stars Abigail Hawk (from CBS’s “Bluebloods” with Tom Selleck), Danielle Marie Fusco (Martha Graham Company, Joyce Soho) Eric Schmalenberger (The Voluptuous Horror of Karen Black, The Citizens Band) and RKP regulars: Elizabeth Stewart, Michael Porsche, Megan O’Connor, Preston Burger, Freddy Mancilla, and Brian Rubiano. Conceived and Directed by Rachel Klein (Circus of Circus at the House of Yes, Princes of Darkness at Theater for the New City, Hound at Planet Connections Theater Festivity). Story by Rachel Klein and Sean Gill. Featuring Music by Borut Krzisnik (Peter Greenaways’ The Tulse Luper Suitcases) Costume and Wig Design by Rachel Klein, Makeup Design by Anita Rundles, and Sound Design by Sean Gill. Stage Managed by Marina Steinberg. Choreography by Rachel Klein, Preston Burger, Danielle Marie Fusco, and the Ensemble. $15 general admission. $12 Students and Seniors. Rachel Klein Productions (RKP) is a NYC-based theater company that strives to communicate its artistic vision primarily through visual storytelling techniques. Relying on innovative performances and lavish design elements, RKP’s ensemble of actors, dancers, circus performers, and performance artists convey a highly stylized representation of reality that is much more bold and often fantastical. RKP aims to create art that explores and elicits genuine human emotion, which is amplified through the actions and reactions of its characters, allowing the audience to simultaneously identify with the human condition and enjoy the artistic qualities of the performance. Rachel Klein Productions has produced several full-length plays (both movement and text based) including Metro, Sir Sheever, Aenigma, and Go-Go Killers!, and co-produced Hound, All Kind of Shifty Villains, and Stage Blood is Never Enough. The Rachel Klein Theater Dancers have performed all over the city in different festivals, art gallery openings, and nightlife events including the opening number to Night of 1,000 Stevies (20th anniversary), the Highline Ballroom, La MaMa Moves! at La MaMa E.T.C. in 2009 and 2010, Dixon Place, the premier of Banzai! at the Red Lotus Room, Low Life @ HOWL Festival, (le) Poisson Rouge, the House of Yes, Rated X at Don Hills, the Hiro Ballroom, the Bushwick Site Fest at 3rd Ward, the Bushwick Open Studios Festival, the World Famous Bob’s Give Thanks!, Galapagos Art Space in DUMBO, the NY Downtown Clown Review, and Off-Broadway at the Bleecker Street Theater (45 Bleecker, Main Theater).